A former British intelligence officer who worked as a double agent for the former Soviet Union has said Russian spies now have "the difficult and critical mission" of saving the world. 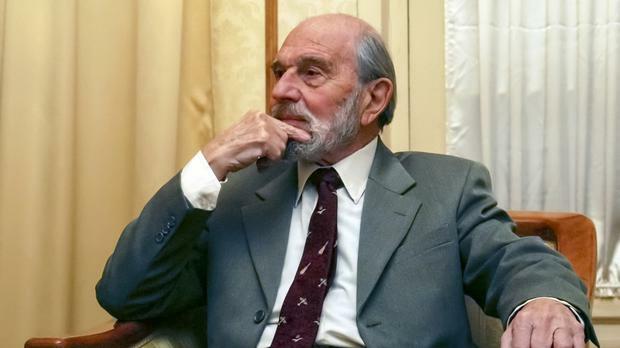 George Blake has lived in Russia since his escape from Wormwood Scrubs prison in London in 1966. He turns 95 on Saturday. Blake said in a statement that the Russian Foreign Intelligence Service must "save the world in a situation when the danger of nuclear war and the resulting self-destruction of humankind again have been put on the agenda by irresponsible politicians". His statement was released on Friday by the intelligence service, or SVR, and carried by Russian news agencies. Blake also said that terrorism has "left bloody traces in many corners of the world". He said: "It's a true battle between good and evil." SVR chief Sergei Naryshkin congratulated Blake on his birthday, saying the spy had been a role model for the agency's officers. As a double agent, Blake passed some of the most coveted British secrets to the Soviet Union, including a Western plan to eavesdrop on Soviet communications from an underground tunnel into East Berlin. A Polish defector exposed Blake as a spy for Russia in 1961. He was convicted on spying charges in the UK and sentenced to 42 years in prison. In October 1966, he escaped with help from several people he met while in custody. Blake spent two months in hiding before being driven across Europe to East Berlin inside a wooden box attached under a car. Blake said in a 2012 interview with the Russian government daily newspaper that he adapted well to life in Russia, and once joked at a meeting with Russian intelligence officers that he's like a "foreign-made car that adapted well to Russian roads". By Associated Press Reporter A Democrat who accused Joe Biden of touching her without permission says the former vice president has been “so incredibly disrespectful” by joking about the matter.